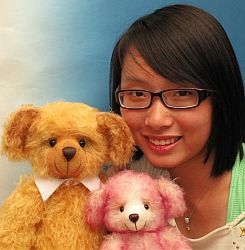 Erica is a 15 years old Chinese girl who has been making teddy bear since she was 10. 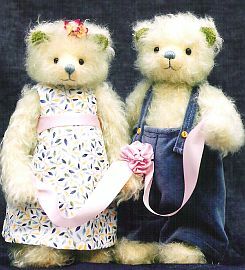 "I enjoy making teddy bears, as I get lots of enjoyment from the process. I think teddy bears are lovely and charming! I will keep on learning from my heart!" she said. Now Erica is 15 years old and she shows of her latest creations. " These are the newest bears I made so far this year!" The Circus. There are 2 clowns and 1 little girl. The little girl is watching the clown show. "The little girl bear reminds me of myself, because I love to watch the circus performances." 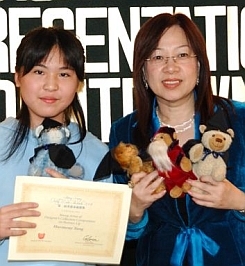 "I won several prizes from the 1st to 5th Hong Kong Teddy Bear Award." The Wedding Children are the 2nd and 3rd teddy bears that Erica made. "These two children are pretending to get marry and they are enjoying playing a lot." Erica said. My Family "These 4 teddy bears represent my father, mother, little brother and me. 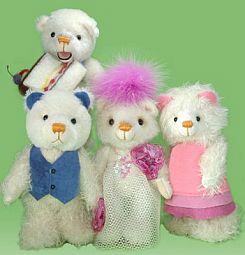 I made these bears according to our characteristics. My father likes to wear suit. My mother loves to wear beautiful clothes. My brother prefers eating cakes and I love pink!" she said. 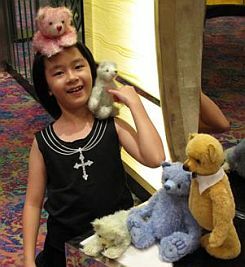 Neroli Leung, is a 9 year old Chinese girl living in Hong Kong too. "I made Emily, a green fluffy bear with some turquoise string Saphira, and a blue standing bear called Custard. And another bear from white and green who is standing; her name is Sasha. I made another, a slightly bigger bear in white and purple. And I will treasure the lessons and information, and learned to operate a a sewing machine. I'm so proud!" she said. 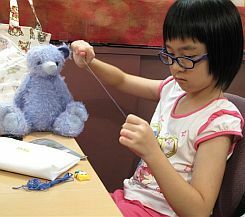 Neroli concentrates as she puts the finishing touches on her newest teddy bear. 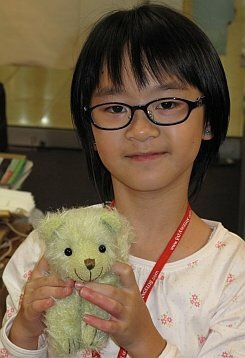 "Thanks to Gloria, my dear teddy bear teacher, I got a chance to make my own teddy bears!" The bears love Neroli as much as she loves them! Neroli Leung's bear has a big smile, just like she has! 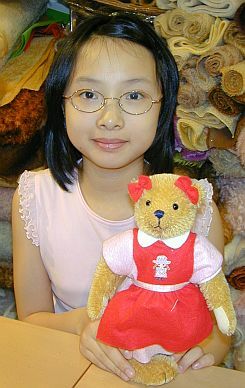 Harmony Tang is another young bear maker. "I made my first bear when I was 10 years old. I was addicted to Harry Potter and I wanted to make a little wizard bear. 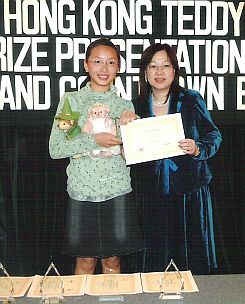 I holding my bear which I got the "First Runner" prize during the 2nd Hong Kong Teddy Bear Competition. 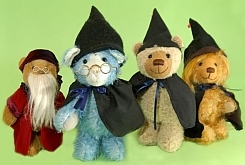 Making bears is a way to satisfy my imagination as I was hoping to go to a wizard school! Although making the bear may takes a lot of time, I think it is worth it and I enjoy it. 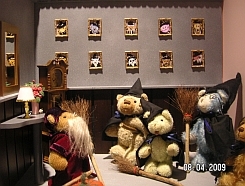 I remember when I making this bear, I insisted using a black color cloth to make the robe, but my teacher Gloria told me it might not be good to use the black color for the young bear, however, the final outcome makes everyone change their mind, I believe it looks very match," said Harmony. "This is my collection of Harry Potter that I made when I was 11 years old. 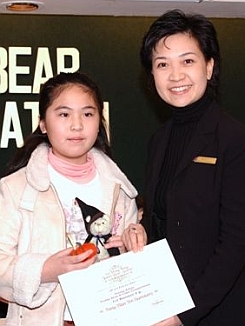 I received the "First Runner" prize in the 3rd Teddy Bear Competition - Young Designer Serious. I am holding Harry Potter, the left one is his friend - Hermione, the middle one is the principle - Dumbledore and the right one is Harry's another friend- Ron. Harry Potter and his friends. 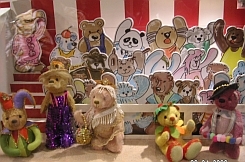 Harmony's bears were in the Hong Kong International Airport exhibition hall. "The bears were put in a beautiful show case and they look very different and beautiful!" she explained. 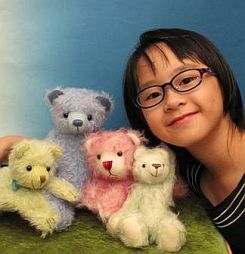 To the right Harmony shows the bears that she made when she was 11 years old. 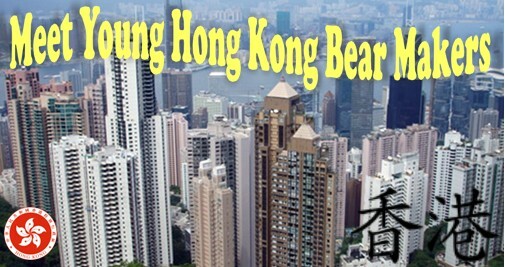 "These bears got the "First Runner" prize of the 3rd Hong Kong Teddy Bear Competition - 'Bears at Home Serious'. I wanted to keep a live cat as playmate since I was very young, but my father thought the cat would hurt me. So I made a little teddy bear which is me and a cat. At least it makes my dreams come true in some way!" said Harmony. 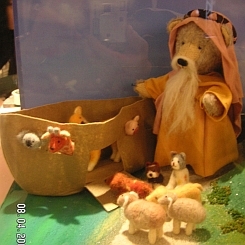 Harmony's Noah and the Ark Teddy Bear won First place in the 5th Hong Kong Teddy Bear Competition - Bible Series. 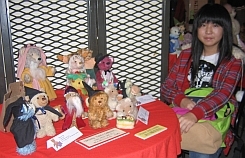 "Hong Kong International Airport - Teddy Bear exhibition 2009, all my Carnival Teddy Bears are in a nice show case with my other friend's Carnival Bears too. 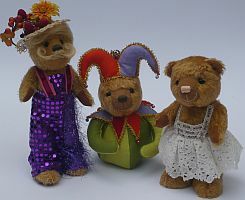 All Carnival Teddy Bears have happy faces and hope it brings the happiness to all the bear lovers." said Harmony. 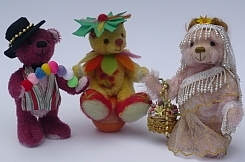 Harmony's bears depict three clowns in a carnival. There is a magician play tricks, a clown bouncing on a ball and a beautiful girl parading. 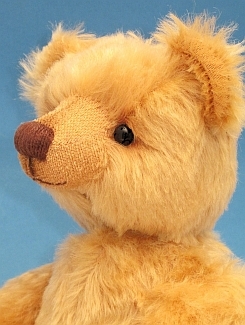 This is an old fashion Teddy Bear, made by Harmony has been entered in the German Teddy Bear competition call the TED. Subscribe today! A years subscription is just $15.00. Artists, become a Member of Bears&Buds today!